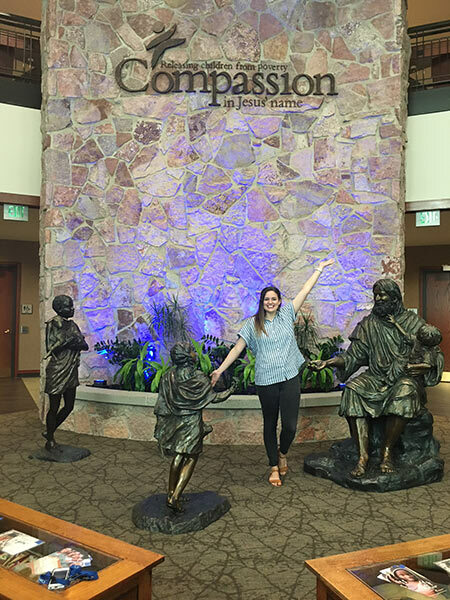 Brock Scholar Kayleigh Hudson completed her summer internship with Compassion International in Colorado Springs, Colorado. From Tampa, Florida to Colorado Springs, Colorado, students in Samford University’s Brock School of Business have completed impressive internships across the country this summer. Through the Brock School of Business Office of Professional Success, many opportunities are available to students throughout each academic year. Locally, marketing major Nate Freeman interned for the Birmingham Barons and was able to work at the Southern League All-Star Game in June. Jack Henry and Brandon Johnson, both marketing majors, interned at Logan Deen StateFarm, learning a detailed overview of insurance sales. Finance major Reed McMullan completed his internship with Regions Bank. He was selected as one of five interns out of 273 applicants from more than 30 universities. McMullan commented, “I really enjoyed getting to learn about mitigating and preventing any type of risk related to the operation of Regions Bank. One of my main projects for the summer was to research and compile data on our peer group of banks and how each one measures risks so the bank can better understand how certain types of risks do and do not affect everyday operations. My experience at Regions was incredible, and I was able to apply the skills that I have learned at Brock School of Business to every day work." In Tampa, Florida, marketing major James Barker interned with Tech Data Corporation, where he was able to work on different projects from corporate strategy to finance. Barker was one of 30 interns out of 1,685 applicants. A highlight of his internship included Tech Data jumping 20 spots on the Fortune 500 list ahead of Nike and American Express. In Tennessee, management major Mallie Campbell interned at the Nashville Bun Company, Brock Scholar Meagan Kennedy interned for Essential Worship, the worship publishing and label group of Sony Music Entertainment in Franklin, and Brock Scholar Abbey Robertson spent her summer with Cushman & Wakefield Commercial Advisors, a third-party real estate company in Memphis. Campbell learned about the different aspects of business and management while Robertson witnessed social enterprise with a company that aims its talents toward the community and Kennedy was hands-on in the music industry. Further north, Sam Hewitt, a management major with a concentration in sports marketing, interned with Muñoz Agency, a sports marketing agency in Cincinnati, Ohio. Through this opportunity he was able to help run operations for NFL Play60 Character Camps and set up camps with NFL franchises including the Arizona Cardinals, the Los Angeles Chargers, the Chicago Bears, the Cincinnati Bengals and the Houston Texans. Brooke Jenkins, a marketing major with a concentration in sports marketing, interned for Rawlings Sporting Goods in St. Louis, Missouri, experiencing new product launches and the company being sold to new owners. She was glad to be able to work with baseball again, having interned with the Houston Astros last summer. Following her 2017 internship, she was asked back by the Astros organization when they went on to win the World Series in November. Out west, in Colorado Springs, Colorado, Brock Scholar Kayleigh Hudson interned for Compassion International, a world-wide Christian organization that helps children in poverty. She began her experience with a week-long mission trip to the Dominican Republic. "Since Compassion is such a massive organization, I had the opportunity to work alongside incredible business professionals who have stepped out of the for-profit sector to serve in a ministry setting,” Hudson said. “One of the most valuable experiences of my internship was being mentored by individuals with such great work experience and a willingness to serve others. Over the summer, I was able to work on research related to leadership and management. My experience was a dream come true!" Ninety-seven percent of students complete internships before graduating, interning both in the United States and internationally. “Internships offer students the opportunity to grow in knowledge and experience, to network with industry professionals and ultimately to decide if this might be a long-term fit for them or not,” said Director of Professional Success Kathryn Boyd. Other internships this summer took place at companies such as Carter’s Inc., Universal Music Group, McGriff Seibels & Williams, Pack Health, Southwestern Investment Group, Porter Capital Corporation, Birmingham Coca-Cola Bottling Company United, Green Sky Credit and FOCUS Brands, just to name a few. To learn more about the internship opportunities available to Brock School of Business students through the Office of Professional Success, see here.